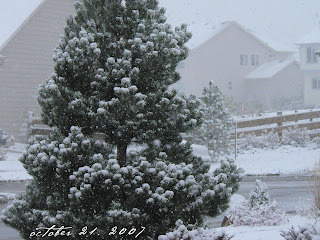 yesterday, october 22, we experienced the first snow fall of the season. my hope was to get past the month of october before a winter storm, but alas, it was not to be. that's okay. sunday morning was exceedingly chilly to wake to. as well as a bit challenging to find winter clothing for the girls to wear to church. but we accomplished the task, and made it to church in the snow in a timely fashion. it snowed all during services. it snowed on the way home from church. it snowed most the early afternoon. this, however, did not stop avery from getting outside in the wind chilled factor temperature of 15 degrees to run, and play and explore the white landscape. her sisters were not too far behind. it was quite windy. surprised me that they played outdoors for as long as they did. our fall season has thus far been so mild and beautiful. we have made it to the park on several occasions on purpose; to draw in as much sun as possible with last winter a not too distant memory.